Canada: Canada Transport truck outside Toronto slaughterhouse Jan 8′ 2014 animals frozen to sides & floor. 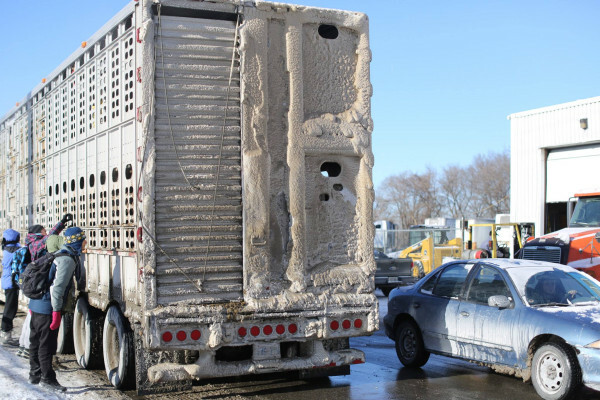 Transport truck outside Toronto slaughterhouse Jan 8′ 2014 animals frozen to sides & floor. SAV Comment – you would think that knowing the current extreme weather conditions in Canada and the US, drivers, managers and authorities involved with live animal transport would at least have some little amount of brains between them to stop this kind of transport in such conditions ! – obviously not – brain dead people.